From (wiki.debian.org -thermald) there is Debian's (Ubuntu's) write up about thermald A Linux daemon for cooling tablets and laptops. This only works for Sandy Bridge (2nd generation) and newer Intel Cores. Once the system temperature reaches a certain threshold, the Linux daemon activates various cooling methods to try to cool the system. Linux thermal daemon (thermald) monitors and controls temperature in laptops, tablets PC with the latest Intel sandy bridge and latest Intel CPU releases. Once the system temperature reaches a certain threshold, the Linux daemon activates various cooling methods to try to cool the system. For most users, this should be enough to bring the CPU temperature of the system under control. This uses DTS temperature sensor and uses Intel P state driver, Power clamp driver, Running Average Power Limit control and cpufreq as cooling methods. This allows ACPI style configuration in a thermal XML configuration file. This can be used to fix the buggy ACPI configuration or fine tune by adding more sensors and cooling devices. This is a first step in implementing a close loop thermal control in user mode and can be enhanced based on community feedback and suggestions. Please read the full Arch Linux TLP link above. There are issues with Nvidia that require configuration changes. After many trials and errors with other packages, I've had great success using TLP. It gives superior fan control and works seamlessly with thermald and p-states. As these installation instructions for Ubuntu 15.04+ mention TLP not only reduces overheating but it extends battery life too. Since installing TLP, Powerclamp (described below) has never been invoked again. Consider the situation where a system’s power consumption must be reduced at runtime, due to power budget, thermal constraint, or noise level, and where active cooling is not preferred. Software managed passive power reduction must be performed to prevent the hardware actions that are designed for catastrophic scenarios. Currently, P-states, T-states (clock modulation), and CPU offlining are used for CPU throttling. On Intel CPUs, C-states provide effective power reduction, but so far they’re only used opportunistically, based on workload. With the development of intel_powerclamp driver, the method of synchronizing idle injection across all online CPU threads was introduced. The goal is to achieve forced and controllable C-state residency. Test/Analysis has been made in the areas of power, performance, scalability, and user experience. In many cases, clear advantage is shown over taking the CPU offline or modulating the CPU clock. How do you know Powerclamp is running? If you see intel_rapl and intel_powerclamp you know it's working and simply waiting temps to exceed 85C. CPU speed is reduced to 1200 Mhz. CPU utilization spikes up to 80%. This is misleading because the extra 70% is sleeping time. The top 9 CPU processes are usually 5 or 6 Chrome processes plus Xorg, Conky, Pulse Audio and an occasional kworker. However now 8 of the top 10 are the kidle_inject/x process where x is from 0 to 7. For the first 8 CPUs. The Powerclamp driver runs until temps drop below 85C again. While the driver is running you might have split second pausing in your videos and possibly split second keyboard and mouse lag. Back in the "cool old days" of Ubuntu 14.04 Intel Turbo Boost was broken so my processor speed fluctuated between 1200 Mhz and 2400 Mhz. After upgrade to Ubuntu 16.04 it would go up to 3400 Mhz (3.4 Ghz) because Turbo Boost was finally working. But it also raised the heat. To "band-aid" fix this problem I pulled the old laptop cooler pad with dual fans out of the closet and popped under the laptop. This dropped temps to 63C under the same workload. The next step will be compress air in vents. After that the final step will be new Cooling Heatsink with pipes for CPU and GPU. Good thermal paste such as Arctic Silver 5 is also needed in that operation. A new fan was already installed last year and that seems to be running ok. Blew out fan vents with compressed air and temps dropped from 63C to 56C. This is still using the laptop cooling pad mind you. Have been using TLP (described above) for many months now and temperatures are steady around 50C and fan performance is optimal. I see the dell_smm_hwmon kernel module / driver. When I google that driver and I8K people report the two drivers cause system freezes for a split-second every 10 seconds or so. I was having this problem myself so had to remove I8K fan control. There are lots of other utilities and cooling methodologies but this is getting TL;DR.
That command will make your CPU cores slow down when they reach 80 degrees Celsius. When the temperature goes down, the CPU cores will be allowed to run faster again. You can find temp_throttle here. you can limit the CPU frequency , so that you can low down the frequency and it can control the Heat from CPU. Not the answer you're looking for? 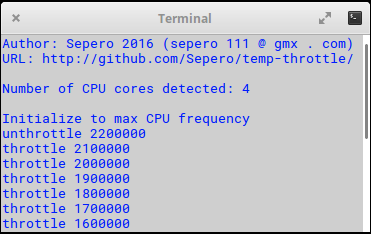 Browse other questions tagged cpu temperature or ask your own question. What are best ways to improve thermal performance on Dell Latitude E5570 running Ubuntu? What can I do to prevent Ubuntu from overheating my Notebook?